Suspect wanted for allegedly kicking a pregnant woman in the stomach in Center City on Feb. 11, 2018. Philadelphia police are seeking help from the public to identify a man who allegedly kicked a pregnant woman in the stomach earlier this month outside a Dunkin' Donuts location in Center City. Authorities said the incident occurred around 10:30 a.m. on February 11, when the 33-year-old victim was standing outside the store at 1000 Arch Street. 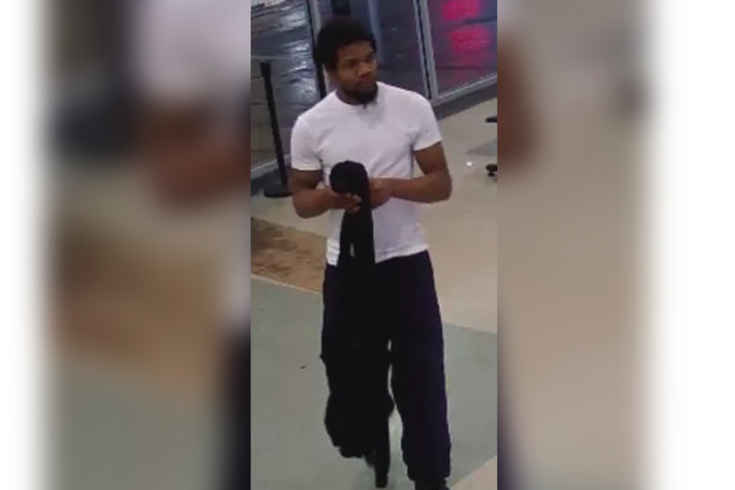 The suspect, pictured in surveillance footage provided by police, allegedly approached the victim and asked her for $2. When the victim told the suspect she didn't have any money, the suspect allegedly kicked her in the stomach. The victim is five months pregnant, police said. Officials said the victim was taken to Hahnemann University Hospital for treatment. Police described the suspect as a black male in his early twenties with a goatee. He was last seen wearing a white t-shirt, black sweatpants, black sneakers and carrying black jacket. Anyone with information about the suspect is asked to contact Central Detectives at 215-686-3093. Confidential tips can be also be submitted electronically.